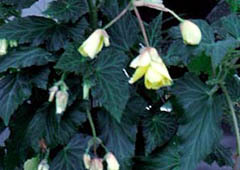 The drooping form of these Tuberous Begonia cultivars make them great for hanging baskets. 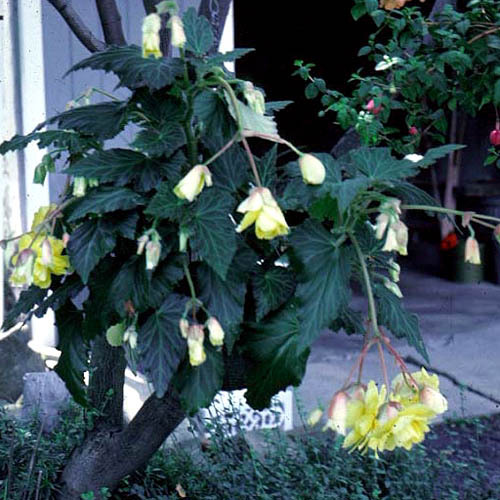 The frost-tender plants are prized for their showy blooms in bright, tropical hues. Best grown sheltered from direct sun and wind. Won't perform well in full sun. outdoor containers - Great for hanging baskets. Tropical perennial grown as an annual. Leaves may also maroon, brown, bronze, or other colors. Propagate by seed, cuttings, division or separation - Sow seeds indoors in very early spring. Take basal cuttings or offshoot stem cuttings during the growing season, or divide the tubers before spring planting. Plant the tubers "eyes up" indoors in early spring in flats of peat moss and sand. Place the trays in a dark location at 65 F until 1" tall shoots appear. Cover the shoots with additional mix and move the trays to a lighted location at the same temperature. Transfer the plants to pots when they are begun to grow well. Plant them outdoors after all frost danger has passed. Water without wetting leaves to prevent foliar disease. In early fall, before frost danger, gently remove the tubers from their beds, cut off the foliage, and place the plants, their roots still covered with soil, in a cool, well-ventilated location until spring. �Apricot Cascade�: 2� tall plants with oval leaves and double apricot-colored blooms with toothed petals. �Illumination Series�: 1� tall plants with deep green leaves and cascades of pastel pink, peach, salmon, white or orange double blooms. Heat resistant. �Lou Ann�: pink blooms on 1� tall plants. �Ophelia�: 1� tall plants with white blooms. �Orange Cascade�: 2� tall heavily branched plants with large double orange- or peach-colored blooms. �Yellow Sweetie�: golden yellow blooms on 1� tall plants.